SOMA return with a fistful of music, having journeyed into the cinematic realms of Ennio Morricone and Sergio Leone with more than a hint of Andre Breton and Luis Bunuel. “The Inner Cinema” continues to explore the filmic qualities that made their debut “Hollow Earth” such a standout album. David Thrussell and Pieter Bourke have now firmly established SOMA as a musical entity with its roots in the 90’s and its sources in the many decades of recorded music. Taking no prisoners, Thrussell and Bourke combine trip-hop with sci-fi, dub with country and tribal with tex-mex. “The Inner Cinema” paints an intriguing soundscape that allows the imagination and the memories to be prompted into a vision splendid. Musically, Thrussell and Bourke have been very active, with David Thrussell continuing to pursue his other projects SNOG and BLACK LUNG, while Pieter Bourke is recording and playing live with DEAD CAN DANCE and LISA GERRARD. You can hear Bourke’s percussive talent working its way through the new SOMA album. Craig Pilkington adds to the album with his trumpet playing on “Baal”. 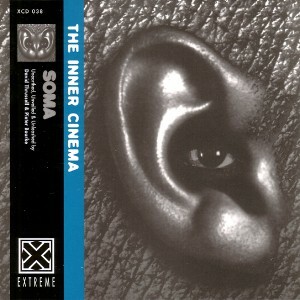 The combining of technology and studio recordings on “The Inner Cinema” reveals another level to the music of SOMA. All that we need now is for Clint Eastwood to agree to a sequel! Formed and Deformed in THE CRYPT & AREA 51, 1995/96.